Home » Somalia: MAP’s Statement on the IDEI 2016 Commemorations held in Gaalkacyo, while a landmark Mudug-Borderline-Meeting called for Establishment of a joint Media Editorial Committee to Promote Peace and Eliminate Demagogic News. Following MAP’s October 17, 2016, press statement in which the syndicate called for an immediate halt to the Gaalkacyo-war and reach a solid agreement that features concrete foundations promising that this will not occur again in the future whatsoever, meanwhile the statement warned media outlets to be used as a weapon to escalate the conflict. With that in mind, the degree of reported inflammatory news published and or broadcasted in the local media was professed acute and needed a swift response to raise awareness in regards to promoting peace and countering hate inflammatory speeches. Given the context, MAP on the 28th October sent a 5-person delegate that was led by its chair and was tasked to observe the media practice in the region and hold meetings with the media managers from both Galmudug and Puntland sides, while taking a vital neutral role MAP bring together both south and North Mudug key media managers. On the 2nd November at the Gaalkacyo Borderline, MAP team, Media managers from South and North held an extra-ordinary meeting with the core objective of this meeting being media’s role in promoting peace and the need to eliminate inflammatory hate news. The meeting brought together chief editors, influential media practitioners from both Galmudug and Puntland sides. The meeting that took place at the roadside next to the famous ‘’Bakhaarka Nabadda’’ (Peace warehouse) building situated at the borderline of Puntland and Galmudug states, resulted to a successful momentum in promoting peace while it called for the establishment of an all-inclusive editorial committee to steer the outcomes of the meeting that was initiated by the Media Association of Puntland (MAP). The MAP chair Faisal Khalif Barre, who chaired this stand-up meeting brought to the attention of the participants on the media’s role in promoting peace, stressing that it is time that the Media in Mudug and Somalia to come-together as a media-family and shape the news, promote peace and drop all types of news that escalates the clashes in Gaalkacyo. MAP chair said ‘’Am extremely thankful that today we stand here together with our brothers and sister from Galmudug and Puntland media, thank you for accepting our (MAP’s) invitation to come together and discuss the media’s role in calming down the ongoing clashes that has resulted to scores of deaths and displacing thousands of families, adding, it is mandatory that we need to hold our hands together as a media family and play a vital role in soothing down the situation, accentuated Faisal! Burhan Abdullahi Hashi – Mudug region’s Journalists chair based in Galmudug appreciated MAP’s role in organizing such an important meeting, he promised on behalf of Galmudug Media to implement the outcome of the meeting. Burhan similarly noted that media outlets in Mudug region have somehow broadcasted news that has fueled the conflict in Gaalkacyo. Formation of 8-person editorial committee tasked to observe and counter online/offline inflammatory hate speeches. MAP will coordinate the editorial committee action plans; Draft support seeking proposals towards enhancing the capacity of the editorial committee members in countering online/offline inflammatory speeches and creation of programs that promote peace and social integration. The advent of a north-south Gaalkacyo Media editorial committee establishment to promote peace through the media and eliminate inflammatory news – agreed at the borderline meeting – is a welcome development, but it remains to be seen whether there will be the necessary institutional coordination and financial, human and technical resources to ensure effective implementation. The deterioration of the security and humanitarian situation in Gaalkacyo as a result of the ongoing crisis has forced thousands of Somalis to flee and seek sanctuary in neighboring villages and towns. On 7 October, armed violence broke out between forces from Galmudug and Puntland, in Gaalkacyo, the capital of the north-central Mudug region, leaving 11 people killed and dozens injured. As of 13 October, according to OCHA an estimated 50,000 – 70,000 people have been displaced, at least 60% of whom are IDPs facing secondary displacement. The violence erupted in the outskirts of Gaalkacyo at a site where the Puntland government is building a livestock market. 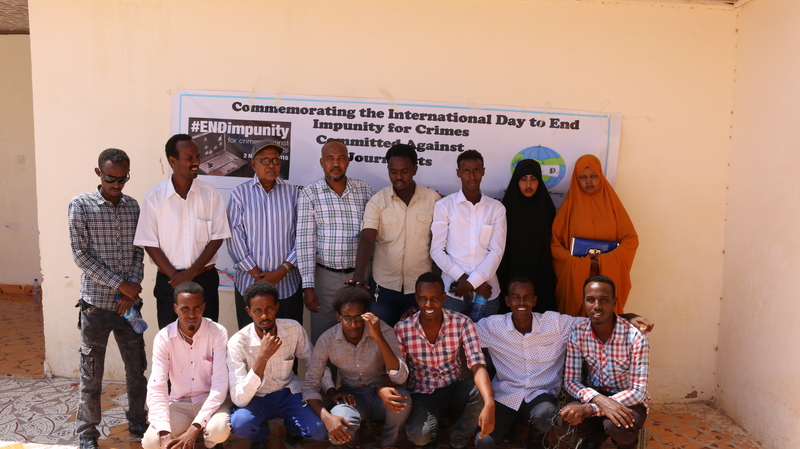 On the occasion of the International Day to End Impunity for Crimes against Journalists, the Media Association of Puntland (MAP) salutes all journalists, freedom of expression organizations, International media support donors all over the continent especially the Somali media development donors for their efforts in creating a free and safe environment for journalists and media workers. MAP’s IDEI 2016 Commemoration was held in Gaalkacyo and was themed ‘’Gaalkacyo needs Peace’’, the event comes at a time Gaalkacyo town was undergoing deadly clashes alongside exchange of hate speeches by officials from both Galmudug and Puntland states through the mass media. The IDEI 2016 ceremony held in Shaariqa hotel of Gaalkacyo city on the November 02, 2016, participation was by the Mudug region Police commissioner – Abdiwahid Abdulle Warsame, the Puntland’s Presidential security advisor gen. Abdullahi Cali Mire Careys, the MAP visiting delegates lead by the MAP chair, Faisal Khalif Barre and the presence of over 30 Gaalkacyo working journalists. The Media Association of Puntland chair Faisal Khalif Barre who open the event with a speech that gave a background of the International Day to End Impunity for Crimes against Journalists (IDEI) 2016, similarly the chair gave a reminder of the fallen journalist who were murdered in Gaalkacyo in the past recent years, of all the six-deceased Journalists in Gaalkacyo from 2010-2014 none of the perpetrators were brought to face justice. MAP chair while giving the background information of IDEI said ‘’The day was first proclaimed in 2013 to commemorate the assassination of two French journalists in Mali on 2 November of that year, It is in recognition of the far-reaching consequences of impunity, especially of crimes against journalists, that the United Nations General Assembly adopted Resolution A/RES/68/163 at its 68th session in 2013 which proclaimed 2 November as the ‘International Day to End Impunity for Crimes against Journalists’ (IDEI) and has urged Member States to implement definite measures countering the present culture of impunity’’, Said Faisal Khalif. This vibrant occasion subsidized by MAP, condemned all attacks and violence against journalists and media workers while urging Puntland State government to do their utmost to prevent violence against journalists and media workers, to ensure accountability, bring to justice the perpetrators of crimes against journalists and media workers, and ensure that victims have access to appropriate remedies. Speaking at MAP sponsored event in observance of International Day to End Impunity for Crimes against Journalists at the Shaariqa Hotel in Gaalkacyo on Wednesday, commissioner Warsame said the Police are good friends with the media, vowing to do all he can to protect journalists while in the discharge of the duties. Puntland’s Mudug region Police Commissioner Abdiwahid Abdulle Warsame, has pledged support to protecting journalists in the Puntland’s Mudug. Puntland’s Presidential security adviser Gen. Abdullahi Cali Mire Careys pledged to support the protection of media practitioners while recognizing the importance of the media to the society especially today when thousands of Gaalkacyo inhabitants flee their due to the armed clashes. Careys challenged the media practitioners on their role to promote peace and not to escalate conflicts as seen in the recent Gaalkacyo clashes. 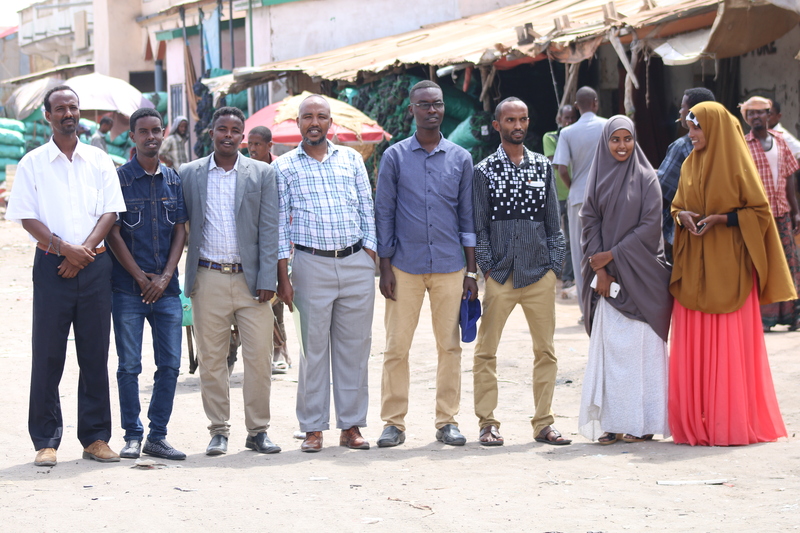 He warned the assembled journalists on broadcasting news that catalyzes the clashes in Gaalkacyo and urged them to be neutral and ethical in their reporting. In Puntland or Somalia Journalists have continued to get into trouble with the government for inquiring about corruption denouncing poor governance, or criticizing repressive media laws. The obedience of the police has been repeatedly exploited to benefit politicians and violate the rights and freedoms of journalists. Political leaders have the capacity to command the police and prosecution services to detain a journalist without following the standard procedures for arrest and detention enshrined in the penal code as well as in the criminal and civil procedures code. foster unity and co-operation among journalists, media workers and governments with the view to strengthening peace, democracy and development. The Media Association of Puntland has been carrying out recently capacity building workshops for journalists aimed to augment the safety of the journalists through safety training, as well as, to sensitize journalists on ethical principles guiding elections reporting and coverage; strengthen the capacity of journalists to monitor elections and report them effectively; and ensure adherence to professionalism as a deliberate means of entrenching Journalists safety , democracy and good governance in Puntland and Somalia at large. Thanks to the donors for their generous support, IMS/FOJO partnership is supporting this activity and many activities that will be implemented by MAP under the project titled ‘’Improving Media Freedom Safety and Media Content for Public Interest Project in Somalia’’.